Product #22122 | SKU FCR-HS4 | 5.0 (based on 2 ratings) Thanks for your rating! Transfer photos, videos, music, and other data between your favourite media cards and your PC with the USB 3.0 High-Speed Media Reader from Kingston. The USB 3.0 connection transfers data at speeds up to 5 Gb/s and supports UHS-I and UHS-II SD card speeds. Supported card formats include CF Type I and II, SD/SDHC, microSD/HC/XC, and Memory Stick PRO/Duo/PRO Duo/PRO-HG Duo. The USB 3.0 media reader has a sleek design with a white body and brushed nickel case in a small form factor, with a built-in LED indicator. 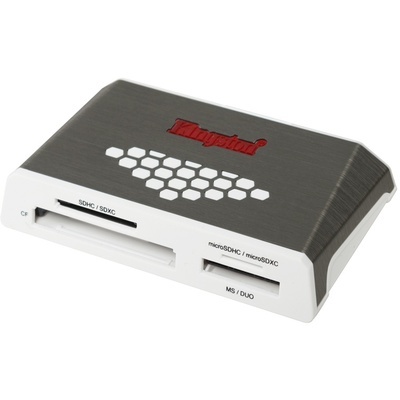 It's backwards compatible with USB 2.0 ports, which is convenient for systems with limited USB 3.0 ports. A USB 3.0 cable is included. Excellent service very happy with the product.